Protech’s Waterarmor™ functional thermoplastic powders are the ideal solution for coating pipes used in the transport of potable water. These products are NSF certified and are Bisphenol A (BPA) free. 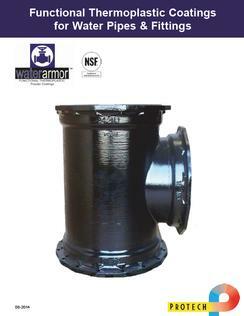 Waterarmor™ can be applied to the exterior of ductile water pipes and the interior and exterior of ductile fittings. 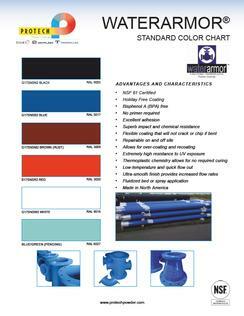 They may also be applied to the interior and exterior of steel pipes and steel fittings. Waterarmor™ coatings are formulated to provide excellent protection against UV exposure and are extremely durable versus weathering. They also furnish excellent impact and chemical resistance. Waterarmor™ powder coatings can be sprayed on or applied using a fluidized bed and no primer is required for these coatings. They are environmentally friendly and are supported by Protech’s unsurpassed dedication to customer service. 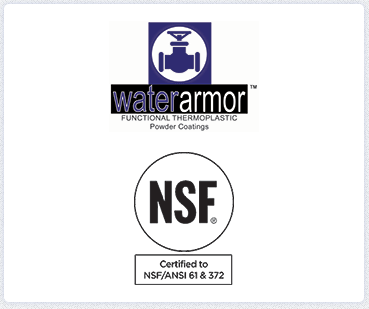 Waterarmor™ powder coatings are proudly manufactured in North America.